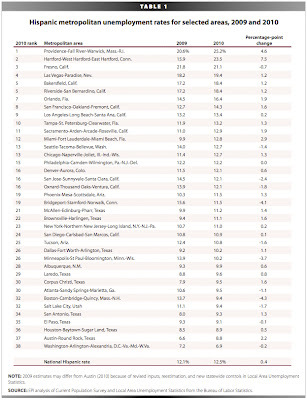 Providence, Rhode Island and Hartford, Connecticut have the first (25.2%) and second (23.5%) highest unemployment rates, respectively, for Hispanics among 38 large metropolitan areas* nationwide, according to a report released today by the Economic Policy Institute (EPI). After Providence and Hartford, the metropolitan areas with the next highest Hispanic unemployment rates are Fresno, CA, (21.1 %); Las Vegas, NV (19.4 %); Bakersfield and Riverside, CA tied (18.4 % for both); Orlando, FL (16.4 %); San Francisco, CA (14.3%); Los Angeles, CA (13.4%); and Tampa, FL (13.2%). “Even though the economy is in an official recovery, 18 of the 38 metro areas in the study saw an increase in Hispanic unemployment of over one percentage point since 2009,” said Algernon Austin, director of EPI’s program on race and ethnicity and author of the report, Hispanic unemployment rates in metropolitan areas around the country. In 2010, the two highest Hispanic metropolitan unemployment rates were in New England: Hispanic unemployment was 25.2 percent in Providence, R.I., and 23.5 percent in Hartford, Connecticut. For Providence, 2010 was the second year in a row Hispanics had an unemployment rate over 20 percent. Hispanics in the Hartford metropolitan area were 3.4 times as likely as whites to be unemployed. In Providence, Hispanics were 2.5 times as likely as whites to be unemployed. 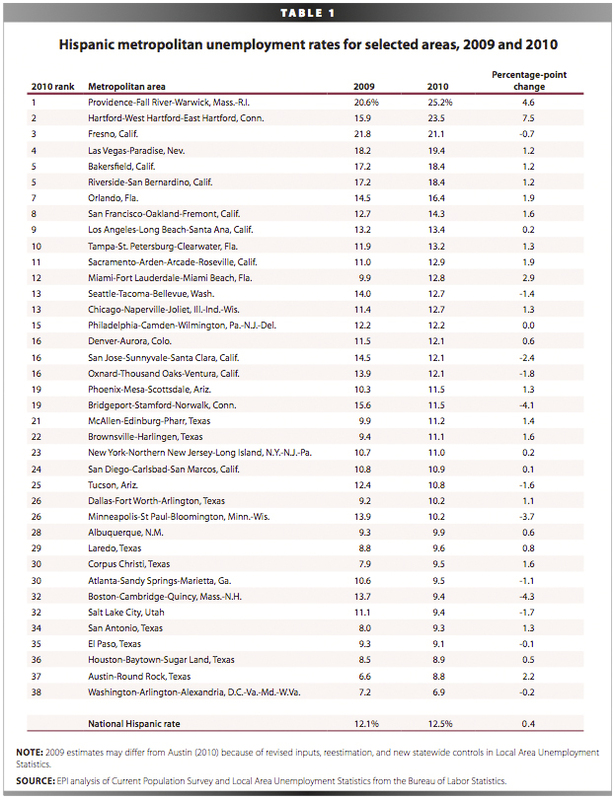 Five California metropolitan areas made it into the top 10 metropolitan areas with the highest Hispanic unemployment rates: Fresno, Bakersfield, Riverside, San Francisco, and Los Angeles. Six Texas metropolitan areas were among the 10 with the lowest Hispanic unemployment rates: Laredo, Corpus Christi, San Antonio, El Paso, Houston, and Austin. Washington, D.C., had the lowest Hispanic unemployment rate. * Unemployment rate estimates were created for metropolitan areas that had a sufficient Hispanic sample size in the Bureau of Labor Statistics’ Current Population Survey for reliable estimates in 2007. Labels: AMERICAN LATINOS, Hispanic Unemployment, LATINOS IN THE U.S.